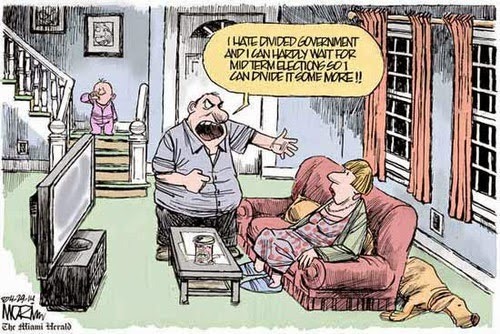 The Dividist Papers: Good news! The Imperial Unitary Executive is going to "get things done". Good news! The Imperial Unitary Executive is going to "get things done". It was a good week for presidential power grabs and executive branch assertions of fiat authority. For our constitutional form of government, not so much. The administration started the week with a PR offensive to assure everyone that the President has a pen and a phone and for some reason this makes Congress irrelevant. Very reassuring. "White House senior adviser Dan Pfeiffer sent an e-mail early Tuesday to preview President Obama's plan to use his executive power in ways Americans have never seen before. "President Obama has a resolution for 2014: That this will be a year of action," Pfeiffer said in the e-mail, pointing out that Obama would no longer be waiting around for Congress to get things done. "Instead, the president will use his executive authority, both his pen and his phone, to work with anyone to get things done..."
"Calling for “all hands on deck” to assist the economy, President Barack Obama is urging his Cabinet to identify ways to keep his administration relevant ...“We’re not just going to be waiting for legislation in order to make sure that we’re providing Americans the kind of help they need. I’ve got a pen and I’ve got a phone,” Obama said Tuesday as he convened his first Cabinet meeting of the year. Obama continued: ”And I can use that pen to sign executive orders and take executive actions and administrative actions that move the ball forward..."
"2014 will be a year of action for the American people — and President Obama is ready to use every executive action available to him to make sure of it... Tell the President you're IN for 2014..."
The Dividist filled out the form and told the President he is IN, but he really isn't. 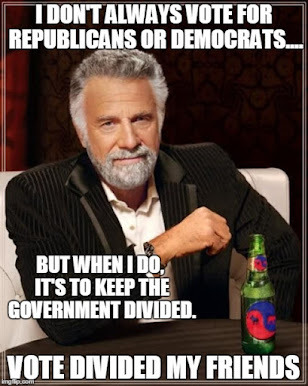 The Dividist is actually much more IN with checks, balance and separation of powers between the executive and legislative branch as intended by the founders and codified in our Constitution. Too bad that Obama didn't get elected president. In a divided government, a president who wants to "get things done" has two choices. The President can attempt to ignore and bypass Congress and implement his agenda by executive fiat. President Obama chose the second path. There are problems with that path. Anything that can be done by the stroke of a presidential pen can be undone by the stroke of a presidential pen. President Clinton rescinded Bush41 executive orders. Bush43 rescinded Clinton executive orders. Obama rescinded Bush43 executive orders, and it is entirely possible that a Bush45 or Clinton45 will rescind Obama executive orders. Not a problem as long as the President does not expect his legacy to outlast his residency in the White House. In addition, ruling the country by executive order runs counter to the spirit, intent and letter of the Constitution, if you care about that sort of thing. But reigning in presidential overreach is not without its challenges. You have to get that third branch involved. Politico: "Can Obama’s Legal End-Run Around Congress Be Stopped?" This is not something the framers of the Constitution would have sanctioned. As the court observed in Clinton, the president does not have “unilateral power to change the text of duly enacted statutes.” That is an important constitutional rule that the current president apparently thinks he can ignore, but the courts must ultimately be willing to enforce." "Jonathan Turley, the Shapiro Professor of Public Interest Law at George Washington University, testified before the House Committee on the Judiciary in December. While Turley said he supported many of the president’s policies, he said he could not subscribe to Obama’s claims of executive power to achieve those ends. "Despite the fact that I once voted for President Obama, personal admiration is no substitute for the constitutional principles at stake in this controversy,” Turley said in his written testimony. “When a president claims the inherent power of both legislation and enforcement, he becomes a virtual government unto himself. He is not simply posing a danger to the constitutional system; he becomes the very danger that the Constitution was designed to avoid." Turley was a frequent guest across the spectrum of left to far left MSNBC shows during the Bush administration. Then he was very critical of the Bush/Cheney Unitary Executive and war power claims. Since he became a vocal critical of the current president's overreach, MSNBC apparently ceased to value his opinion. "In my view, this is not a close question and that the President has, again, disregarded the purpose and language of the Constitution to deal with a political impasse in Congress. Now that the Democrats have curtailed the use of the filibuster power, a negative ruling may trigger a new round of such changes. That is a political decision. However, this constitutional dispute raises an important question of the limits on executive power in a system increasingly dominated by the Chief Executive. I believe that the Democrats will soon loathe the day that they assisted Obama in this expansion of power when another person sits in the White House." 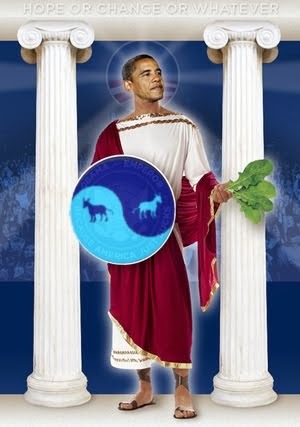 "President Obama has invoked a far broader authority to tailor laws based on his judgment and discretion. This may be done ostensibly to “improve” the law as with the one-year waiver for individual policies or to mitigate the hardship of a law as with the immigration law. These happen to be areas of great political division in the country as well as substantial opposition to the President’s policies in Congress. Many applauded the President’s transcending politics by ordering such unilateral action without considering the implications of such inherent authority for the system as a whole. Once again, it is important to divorce the subject of such legislation or the identity of the president from the constitutional analysis. The circumvention of the legislative process not only undermines the authority of this branch but destabilizes the tripartite system as a whole. If President Obama can achieve the same result of legislation by executive fiat, future presidents could do the same in negating environmental or discrimination or consumer protection laws. Such practices further invest the Administrative State with a degree of insularity and independence that poses an obvious danger to liberty interests protected by divided government. This danger is made all the more menacing by the clear assumption by the Executive Branch that artificially narrow standing rules will insulate the orders from judicial scrutiny and relief. With Congress so marginalized and courts so passive, the Fourth Branch threatens to become a government unto itself for all practical purposes." Elections have consequences, and the main message of the last two (and probably three counting 2014 midterms) is that the American electorate do not want President Obama to have the power to unilaterally impose his partisan agenda nor arbitrarily "tailor laws based on his judgment and discretion". One thing we've learned over the last dozen years is that the protections afforded by the tripartite checks and balances in our constitutional framework are undermined when one party controls both the executive and legislative branch. We saw it with four years of Republican one party rule under Bush and we saw it with two years of Democratic one party rule under Obama. Too many of our congressional representatives are willing to elevate party loyalty over constitutional responsibility and institutional respect for the legislative branch. Republicans in Congress only behave like responsible Republicans when there is a Democrat in the White House (see deficit and debt under Bush). Democrats in Congress only behave like responsible Democrats when there is a Republican in the White House (see civil liberties and war powers under Obama). When we have one party rule, the legislative branch abrogates their constitutional responsibility to the executive branch. It's just what happens. It's the reason we cannot allow one party rule in this country for the foreseeable future.